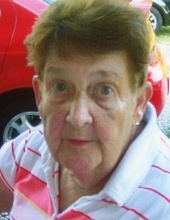 Elsie Mae Rogers Carpenter, age 80, widow of Ralph Carpenter, died Monday March 19, 2018 at the Hospice Compassionate Care Center in Richmond. A native of Madison County she was born February 8, 1938 to the late Bert Rogers and Grace Powell. She was a breast cancer survivor for over 20 years. Loved to read and enjoyed flowers, but most of all loved her children and grandchildren with all her heart. Other than her husband and parents she was preceded in death by two brothers, J.D., and Dallas Rogers, one sister, Christine Marcum and a great granddaughter, Kimberly Carpenter. Mrs. Carpenter is survived by her children; Billy (Suzy) Carpenter of Richmond, KY. Judy (Tony) Fowler and Brenda (Steve) O’Neal both of Berea, KY. One brother, Paul Rogers of Richmond, KY. One sister, Marie Stewart of Richmond, KY. Seven grandchildren, Jimmy Carpenter, Bobby VanWinkle, Ralph Edward Carpenter, Garrett Adams, Christopher Adams, Breanna Mae Carpenter, and B.J. Carpenter. Fourteen great grandchildren also survive. To send flowers or a remembrance gift to the family of Elsie Mae Carpenter, please visit our Tribute Store. "Email Address" would like to share the life celebration of Elsie Mae Carpenter. Click on the "link" to go to share a favorite memory or leave a condolence message for the family.